Ecoventura's environmentally friendly fleet of small expedition vessels in the Galapagos allows guests of this visionary small-ship travel company (http://www.ecoventura.com/) to experience the Galapagos from as many land and water perspectives as possible. This includes snorkeling. "Guests often tell us that their most sensational and enjoyable wildlife viewing comes from behind a mask while snorkeling," said Ecoventura spokeswoman Doris Welsh. "They also report how amazed they are with the number and variety of snorkeling outings we include in our itineraries." She said that in addition to guided shore excursions, guests can opt to snorkel or kayak at least once and sometimes twice daily in Galapagos waters. "Plus our small yachts (20 passengers) give our guests more opportunities to snorkel as compared to bigger vessels that take more time with the logistics of loading and unloading larger groups." "These are not-to-be-missed opportunities to snorkel with playful sea lions, penguins, sea turtles, graceful rays, tropical fish and even friendly sharks. You may even be able to snorkel with dolphins or find yourself spectator to a friendly feeding frenzy," she said, recommending Gardner Islet at Gardner Bay for tropical fish, sea lions, rays and sharks; Sombrero Chino for penguins; and Punta Espinosa for sea turtles. Following are Ecoventura's tips on how to make the most of a snorkeling adventure in the Galapagos. >Find a mask that fits. When pressed to the face it should stick (better yet, bring a mask and snorkel from home, but do use the fins on board the ship (these are bulky items and take up too much room in a suitcase). >Bring a skin suit (and dive gloves) to wear underneath the wet suit provided on board. The skin provides added warmth and an extra layer of protection. Note that at the surface, Galapagos waters are very comfortable for snorkeling averaging 70 to 78 degrees F varying on time of year, currents and depth. >Always snorkel with a buddy and stay within eye distance and ear shot of the group and Zodiac. Life vests are available and recommended for some swimmers. >Consider July to October for optimum snorkeling. Water temperatures are warmer December to May, however the marine mammals (dolphins and whales) as well as sea lions and sharks are more active when temperatures are cooler July to October. Welsh points out that, "Starting in 2012, due to new regulations for all cruise companies in the Galapagos, ships will no longer be in port for a full day during the cruise itinerary so the possibility of scheduling an optional "dive day" will no longer be possible. 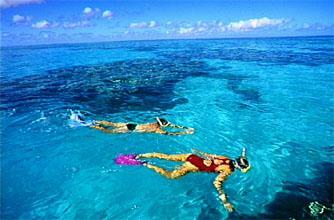 However snorkeling, especially in deep water, will still provide a "dive like" experience." Ecoventura last year helped launch DivEncounters Alliance (http://www.divencounters.com/) to handle sales and reservations for the growing scuba dive market in the Galapagos and elsewhere. For scuba divers who want to combine diving in Galapagos with wildlife top side, the fleet's luxury dive live-aboard, Galapagos Sky offers one week in tandem with a second week on Eric, Flamingo or Letty. Passengers are eligible for a 5 percent discount on selected departure dates.